Our Abpromise guarantee covers the use of ab30967 in the following tested applications. WB Use a concentration of 0.5 µg/ml. 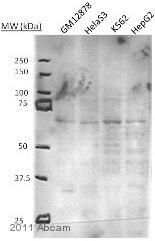 Detects a band of approximately 57 kDa (predicted molecular weight: 61 kDa). Good results were obtained when blocked with 5% non-fat dry milk in 0.05% PBS-T.
ab30967 has not yet been referenced specifically in any publications. Publishing research using ab30967? Please let us know so that we can cite the reference in this datasheet.